For most of his life, he lived in Zionsville, Indiana. Shirk then started performing in the Eitel Jorg Museum. Bill Shirk, graduate of Ball State University, is the premiere escape artist from Indianapolis. Born 1945, the Indianapolis man is not only an escape artist, but also a radio personality, and an actor. 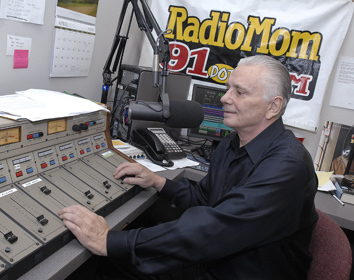 Throughout the 70s, 80s, 90s, and 2000s, Bill Shirk played a huge role in Indianapolis radio. But he didn't stop there. He additionally made a mark as a magician. Wanting to boost the ratings for his new show, Shirk decided to climb its antenna on top of Chase Tower. He shimmied up the 250-foot pole during a thunderstorm. The winds twisted around him, bending the pole like a plastic toothpick. Then a man shouted at him to come down at once. Turns out, Vice President Dan Quayle (also from Indianapolis, incidentally), was coming to Chase Tower to give a presentation. Something about a man climbing a 250 foot pole on top of Chase Tower didn't sit well with the Secret Service. The publicity stunt worked, boosting the ratings of the new station more than 300 percent. In fact, that's why he did them. Not for the love of it. Not because it made him feel alive. Not for the thrill of it. He just wanted to boost the ratings of his radio show. And it worked. In four short years the Indianapolis man set eight guinness world records--the fastest strait jacket escape and fastest jail break in the world. Throughout Shirk's career, he has been buried alive ten times. Like Harry Houdini before him, the man was buried alive for over three days. But Bill upped the ante, raising the stakes by being buried with two tarantulas, a rattle snake, and an enormous ten-foot python. It wasn't just broadcast in Indiana. Radio stations and televisions covered this across the globe. In 1983, the man set his sights higher, taking on a role as an actor. Closely mirroring his real life, he portrayed himself, Bill Shirk, in The Escapist. In the movie, he tried to save his precious station from a ruthless corporation. Harry Houdini before him escaped from a straight jacket hanging upside down suspended from a crane (a magician's secret is that it's actually easier--not more challenging--to escape from a straight jacket upside down. Bill Shirk again upped the ante. The Hoosier daredevil escaped from a straight jacket while suspended from a helicopter almost 2,000 feet in the stratosphere. In 1992, Shirk nearly died when he was buried alive under 1400 pounds of wet cement in a solid plexiglass casket. The casket collapsed on Bill. This was enacted on the anniversary of Harry Houdini's death. Now in his 70's, he said, “I’ve really lost interest in trying to kill myself." Hoosier Broadcasting moved studios of its channel in Boone County, from the Pyramids office park near North Michigan Road and Interstate 465 to new venues in Lebanon, Indiana. Catholic Radio Indy uses a station owned by Hoosier Broadcasting. Despite being a millionaire, something about the magic of radio still has it's hold on Shirk, and he's not ready to retire. It gives him something to do every day that doesn't involve magic or escapes. Bill Shirk is not like most of the other hillbilly Hoosiers in Indianapolis, just as the music on his radio station isn't like most of the other music from stations in Indianapolis.